I wish i was a magical girl. You are now a magical girl! But......your cognitive abilities aren't functioning too well....OoOOOOOO! You're like Sailor Moon! I wish to be fluent in Japanese and Korean! You're a world wide famous otome game creator. 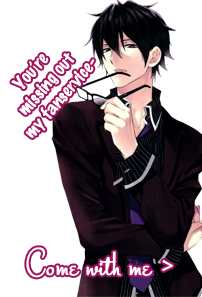 However there are girls everwhere stalking you and demanding otome games! I wish I had a drawing tablet so I can draw digitally. Wish granted~ You earn money doing nothing. However, now you are so lazy that you can't do anything. Your wish is granted!~ But now you have grown wings because that's the only thing that can help you fly. I... wish I could live solely on toast... (buttered toast, to be exact... haah... that stuff is so nice). Your diet consists of only buttered toast and you are still alive and well. However because of eating butter you have a lot of blemishes? Your wish is granted~! But you end up unable to stop dancing, even while you're tired or sleeping. I wish that I had a watermelon. Your wish is granted (which it might have been since you posted this a month ago..), but the watermelon is filled with these weird, new breed of watermelon-worms. I wish I could speak Japanese without having to learn it (inborn-talent?) . I actually did eat watermelon since then. XD Those watermelon worms were delicious. Granted~ But you are incapable of understanding what others are communicating, no matter the language. I wish that I could not get paper cuts. I wish i lived in a little cottage in the woods.. Your wish is granted, but the Big Bad Wolf broke inside and ate you one day. I wish college was absolutely free. Granted, but all colleges can afford to unwittingly hire are aliens who intend to enslave and eat the human population, starting with mind control. I wish that the space a kilometer all around me always smelled good. Gotta get rid of that pesky BO in my portion of the world. Your wish is granted but your nose suddenly can't smell anything good and only can smell the bad ones. I wish I can understand all language that exist really good. Your wish is granted, but you suddenly fall deaf due to an accident. Your impressive language skills aren't very useful now. I wish there was a button for systematically relieving all of your stress . Your wish is granted, but without any stress you become so calm that you don't care about your house burning to the ground. Who needs that stress anyway? I wish to be able to defeat my opponents in chess. I basically never win irl. then you're end up alone for all your life..kahaha ..hhehe..
Wisp Night wrote: Your wish is granted, but you suddenly fall deaf due to an accident. Your impressive language skills aren't very useful now. I wish there was a button for systematically relieving all of your stress ;). Lol ;). I guess your wish isn't so bittersweet, then ^-^. I wish I knew how this thread is still active after so long jk..its obvious! SamrockAniki wrote: I wish I knew how this thread is still active after so long jk..its obvious! Your wish is granted but that means that more otomates and animes have to be discovered in order to keep it going! I wish that my cat could stop eating cardboard boxes while I sleep.